Author Elaine Dimopoulos greets Erin Galloway at the BPL party. 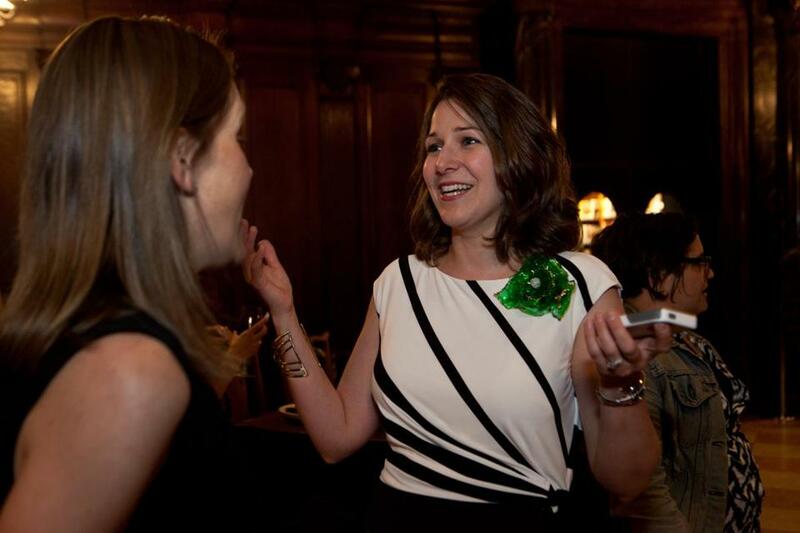 The Boston Public Library hosted a party Tuesday night for local author Elaine Dimopoulos, who released her young adult novel “Material Girls” the same day. Dimopoulos wrote the book when she was the BPL Children’s Writer-in-Residence from 2010 to 2011. Her novel — which was picked up by Houghton Mifflin Harcourt — has been compared to “Project Runway” and “The Hunger Games.” The guest list for the festivities included writers Kate McGovern, Mackenzi Lee, and Annie Hartnett; YaleWomen Boston president Lisa Goldman; Weber Dance artistic director Jody Weber; Dimopoulos’s editor Margaret Raymo; and the current BPL Children’s Writer-in-Residence, Natalie Coward Anderson.